While Eye Care Northwest owner and ophthalmologist Karen Winchester's mush­room-and-feta scramble siz­zles over a hot pan, she cuts kale into ribbons and sprin­kles them onto the eggs. For some, kale is a highly nutritious vegetable. For oth­ers, it's a reminder of Port­land's hipster culture. But for Winchester, it is a vital source of eye protection. 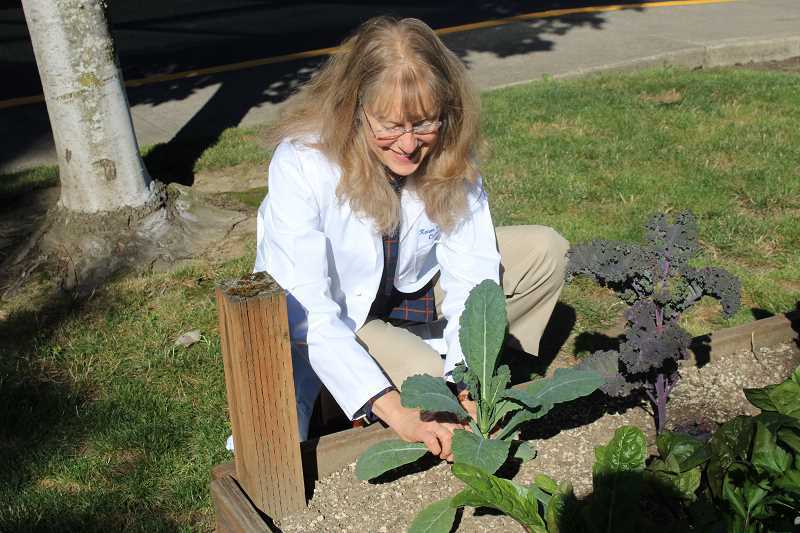 So in order to promote kale as well as the consumption of other leafy and eye-protective greens, Winchester has devel­oped a garden outside of the Eye Care Northwest office in Multnomah (Southwest 31st Avenue and Capitol Highway). The garden includes kale, spinach, chard and nasturtium flowers, and Winchester offers a bag of veggies to patients at the end of appointments. She currently has two gar­den boxes provided by Meals on Wheels. "I'm such a believer in how helpful this is that I planted a garden," Winchester said. The retina, located in the back of the eye, captures sen­sory images, and the optic nerve sends this information to the brain. When humans read, they use a special part of the retina called the macula. Glaring at sunlight and high-energy light rays can cause damage to the macula, but pigments called lutein and zeaxanthin help protect the macula from damage. Dark, leafy greens such as spinach and kale contain high levels of these pigments. A 2013 age-related eye dis­ease study found that con­sumption of lutein and zeaxan­thin can decrease the rate of macular degeneration, which can cause significantly reduced eyesight. Winchester also points to another study that shows that these pigments can reduce the severity of diabetic retinopathy, which causes vi­sion problems and sometimes blindness among the diabetic. "This is standard practice for ophthalmologists to rec­ommend to their patients that when they have a certain lev­el of macular degeneration, they should take vitamins," Winchester said. "I probably am more focused on getting the nutrients from our diet." Winchester adds that ex­cessive smoking and sugar intake can cause damage to the macula as well, and that intake of omega-3 fatty acids can protect the eye. "If anyone wonders what they can do, the three things they can do is eat a diet with leafy green vegetables, wear sunglasses and do not smoke," Winchester said. "It's become cliché. 'Oh, diet and exercise is good for you.' Of course. But it's so important. And there's a way of communicating this that is meaningful for some­body or sticks better." Winchester was not a gar­dening enthusiast prior to overseeing the garden at her office, and she needed help from an experienced garden­er to get started. But she in­vested the time and energy not for her love of vegetables, but for her conviction that di­etary choices can impact the longterm health of the eyes. Still, she doesn't force greens upon her customers. "I offer it to them. I don't like to be too pushy. Some people, you say the words spinach or kale and they make a face. It's there for them if they want it," she said.